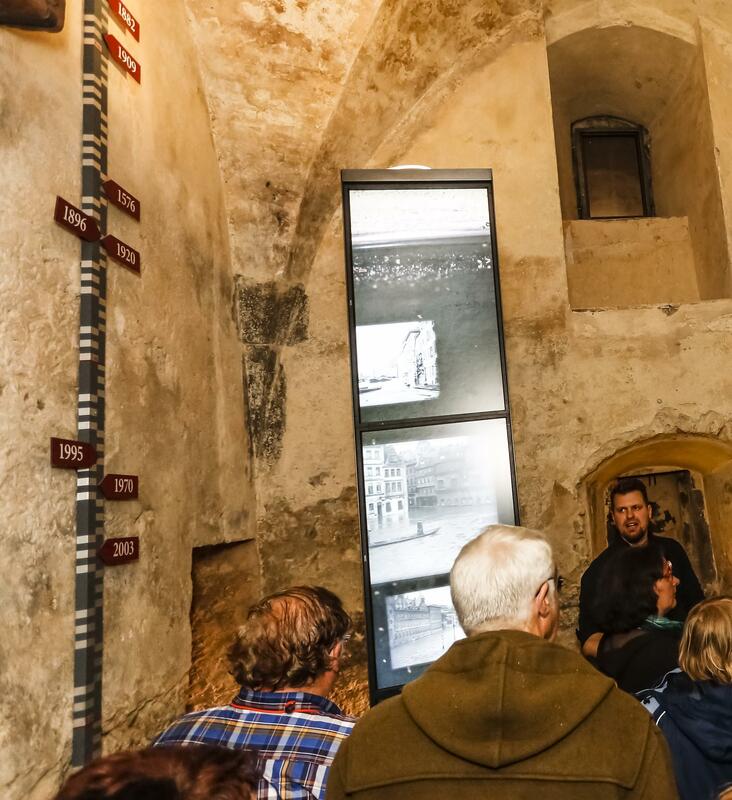 Inside the Rententurm (Toll Tower), a historical and a current panoramic view of life on the Main River opens up around the visitor. The basement’s main theme is the river. 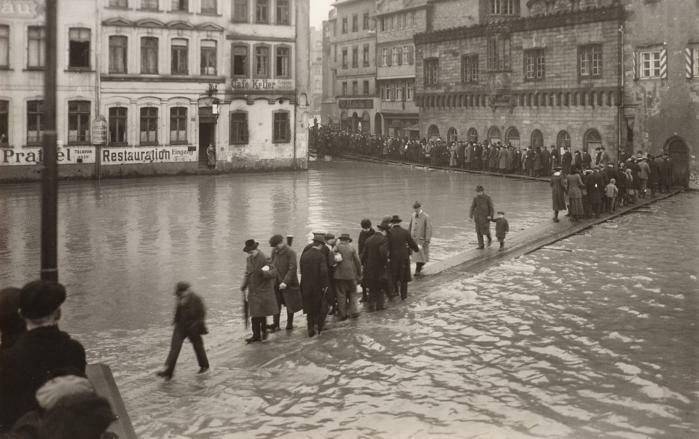 Photographs and films from the 19th and 20th centuries, together with light marks, show the flood level. 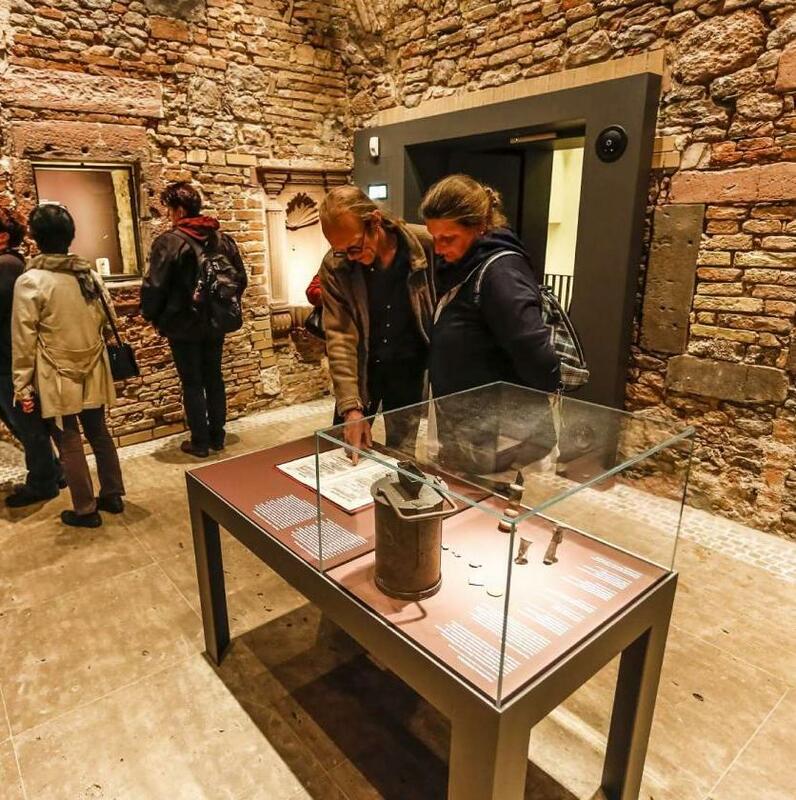 In the floor above, where the “toll office” was from the end of the 15th century, the theme is all about the history of Frankfurt’s economy and trade. Vivid objects create a lively impression of the connection between port and trade, toll and tax payments as well as the activities in the toll office. The tower clock can be seen on the first floor. The clock ticks loudly and sets both the tempo and time for the entire floor. The highest accessible floor offers the most beautiful view of the area and the riverbank opposite. 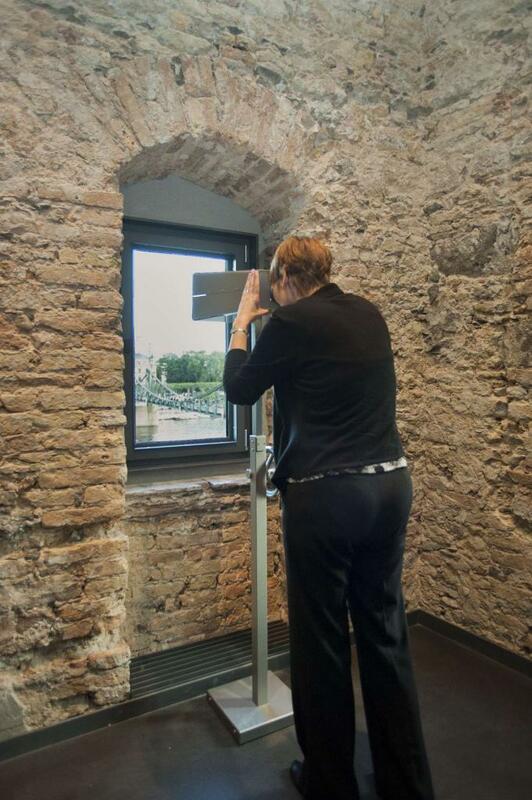 And so what could be more appropriate than getting to grips with the opening of the city wall – in other words, removing the borders of the city – and the Sachsenhäuser summer houses of the 18th and 19th century than with this “beautiful view”? Four pictorial telescopes mounted on all four sides of the gallery balustrade provide historical views from the windows which can be compared with the same perspective as those from the past three centuries. Frankfurt has its convenient location on the river to thank for its emergence and development. With its abundance of fish, the Main was an important source of food for the inhabitants of the city, but also provided protection from invaders. As well as this, the waterway was a safe connection to the world and an important trade street. Fords and shallows, where the water was not much deeper than one metre, lead through the Main in Frankfurt. There, it was easily possible to cross the flat, slow-flowing river. It was only in the Staufer period that a bridge was built and connected to the city wall. The Rententurm (Wharfinger’s Tower) was built from 1454 to 1456 as part of a later town fortification. It was supposed to monitor the comings and goings in the town and facilitate toll collection. The port on the waterfront in front of the Rententurm was the economic centre of the city. All kinds of goods were disembarked here and sold directly on the waterfront or in the markets close by. However, the river could become dangerous for the city’s inhabitants: strong flooding often posed a threat to the city. In winter, the Main often froze over. Ice drifts could then destroy the bridge and impede ship operation. The city also often experienced low water levels. As of 1883, the river was regulated, straightened, dredged and equipped with barrages. 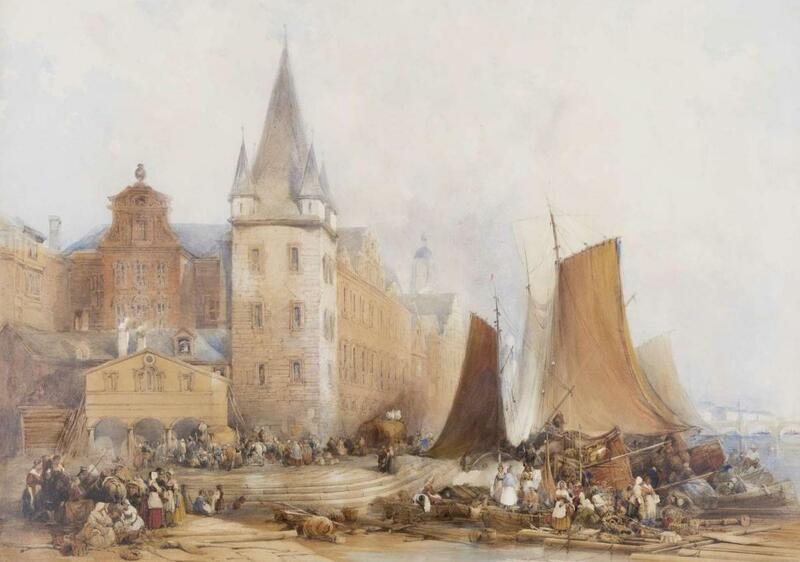 The waterfront in the city was fixed with new wharfs as early as the 1820s. The Rententurm (Toll Tower) is a four-storey gate tower on a square floorplan with a pointed spire and four turrets. It was built from 1454 to 1456 by Eberhard Friedberger. The tower is part of the Saalhof ensemble, the Staufer imperial palace from the 12th century. As the Rententurm was built, the complex was no longer in the possession of the empire, but rather was under private ownership. 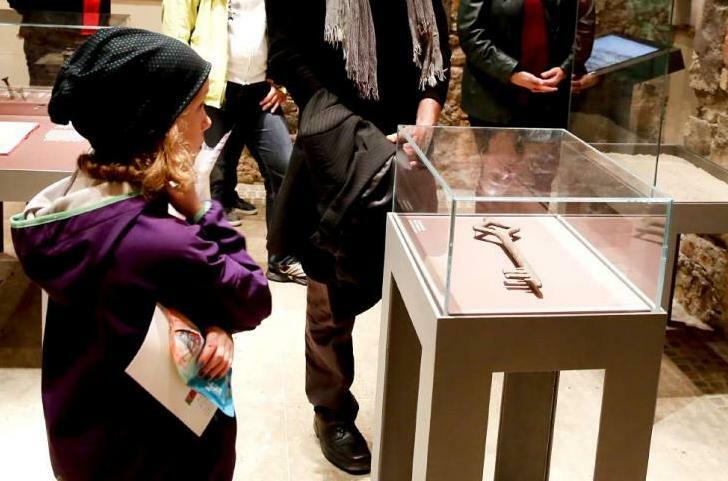 It served as both military protection of the city gate (Fahrtor) and for collecting tolls and port charges. The city prison was temporarily in the basement of the tower, but filled up with water when the Main flooded. Inside, the wood-panelled Rentenstube was on the first floor. 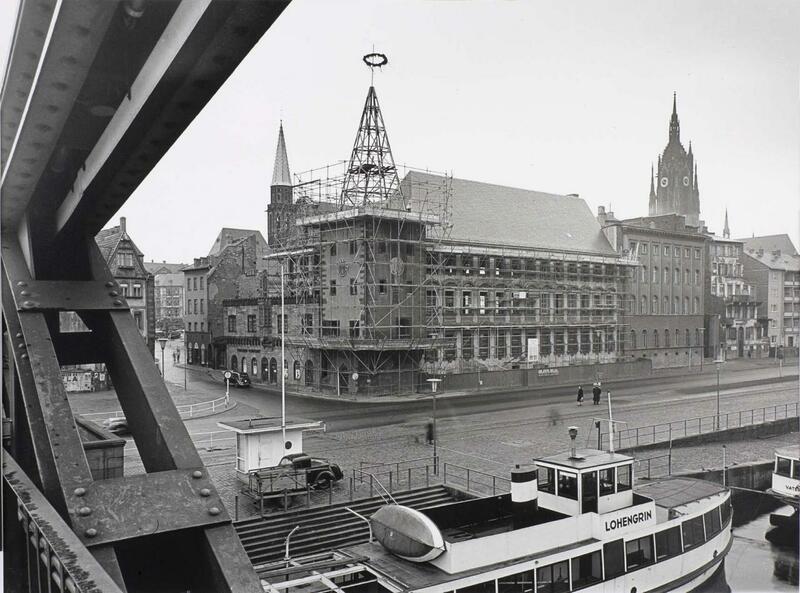 The large hall in the attic, created in 1455 by master carpenter Henze Monkeler, was considered one of the most beautiful viewing points in Frankfurt. 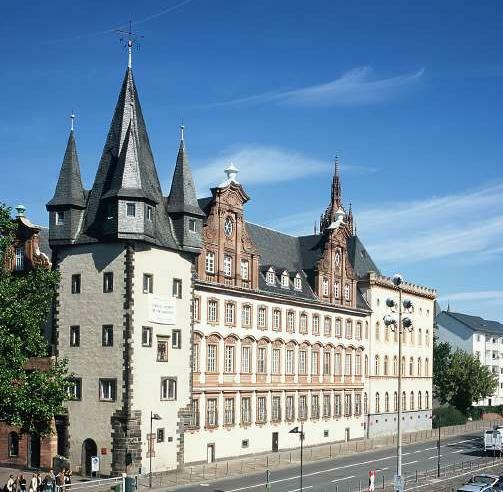 From 1715-17, the Baroque Bernusbau was built instead of the river wall as a city palace for a Dutch family of merchants based on the plans of Arnsburg Cistercian Bernhard Kirn. Since then, the building has been the Rententurm’s immediate neighbour. When the Main’s riverbanks were raised in the 19th century, the tower lost around three metres of its visible height. After the First World War, writer Fritz von Unruh lived in the tower. During the Second World War, parts of the tower burnt out and the distinct roof with its pinnacles was destroyed and the clockwork went missing. Following the war, the damaged pieces were re-built, staying true to the original. However, a suitable clockwork was first installed in 2012. The Rententurm is one of only three remaining gate towers of the Gothic town fortification; the other two are the Eschenheimer Turm (1428) and the Kuhhirtenturm (1490) on the left bank of the Main. Time plays an important role in the Rententurm. The clock on the southern side of the Rententurm displays the time to passers-by on the Eiserner Steg (Iron Bridge). In historic etchings, the appearance of the Rententurm is significantly characterised by the two black dials of the clock built into the tower. As part of the renovation of the museum’s old buildings, the clock was restored to give the Rententurm its characteristic appearance once more. The extent to which a reconstruction of the clock would even be possible was not clear from the beginning. 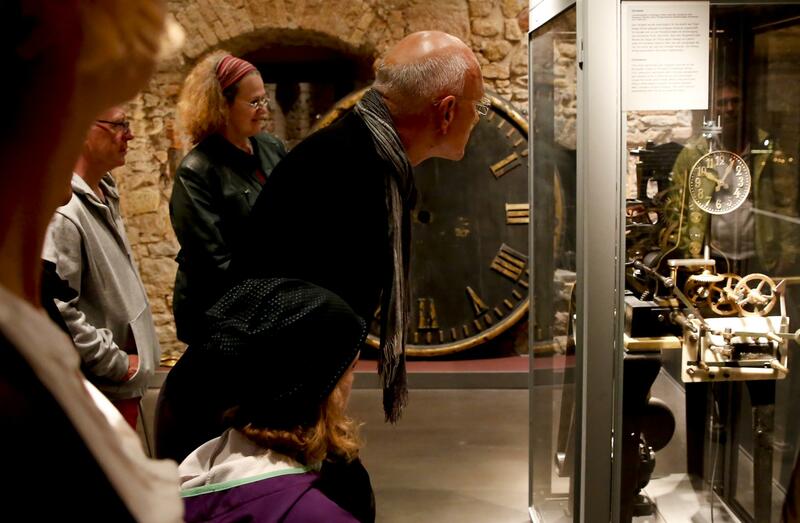 Although the dials and hands of the clock had remained in possession of the museum, the clockwork was lost during the war. 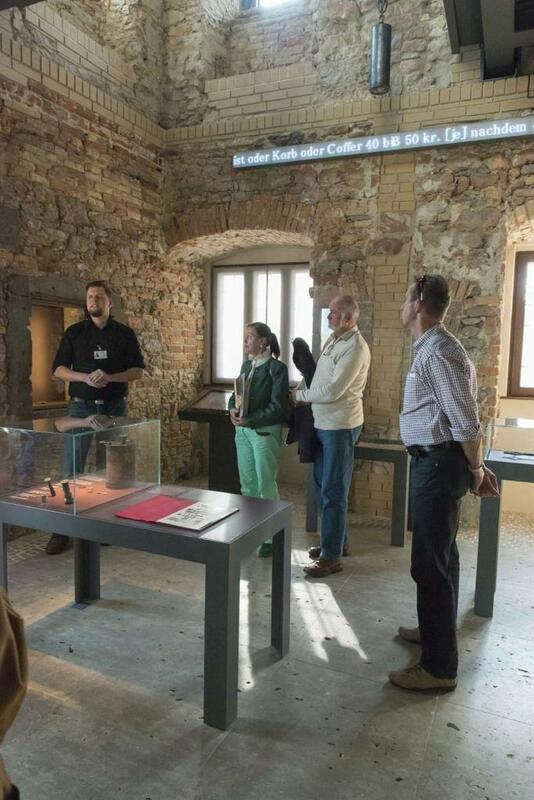 It was therefore fitting that the Historical Museum had acquired a clockwork in the 90s, which stood in the barracks east of the Friedberger Warte, and was offered to the museum to purchase before the withdrawal of the Americans and the demolition of the barracks. The clock was in a wretched condition, but fulfilled the requirements to be installed in the tower, according to Reinhard Glasemann, the restorer in charge of the project. It is the right size to move the powerful gold hands. What is more, it has no chiming mechanism (befitting its purpose in a military casern) and will thus not be in competition with the hourly chiming of the Römer (town hall), the cathedral and the Dreikönigskirche (Church of the Magi). Provided by the company Korfhage in 1937, it already has an electric hoist, meaning no museum staff or night watchmen need to manually wind the clockwork daily – enabling practical operation in the Rententurm. It can be visited as an attractive part of the permanent “At work” exhibition. The city gate (Fahrtor) was situated directly next to the Rententurm. 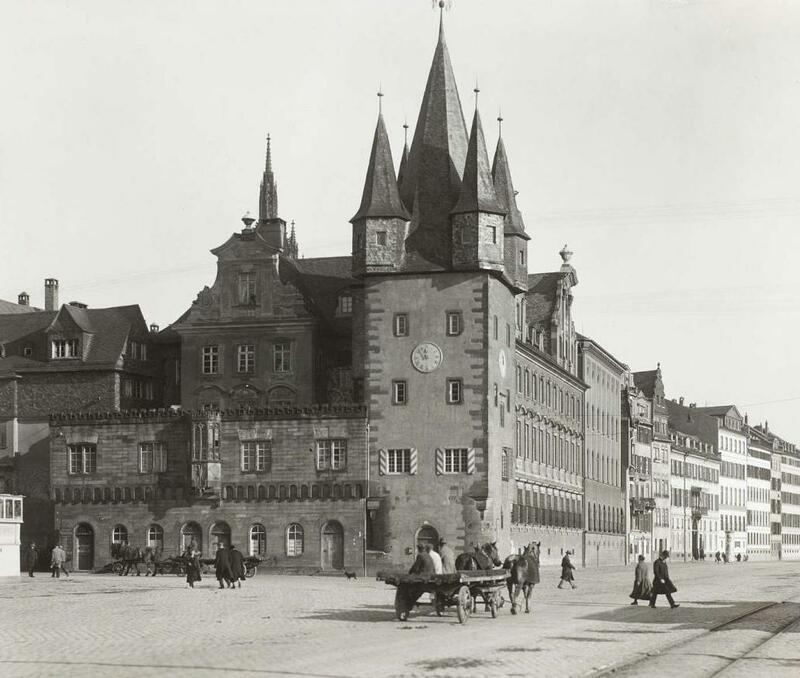 For centuries, it was the most important toll station in Frankfurt. 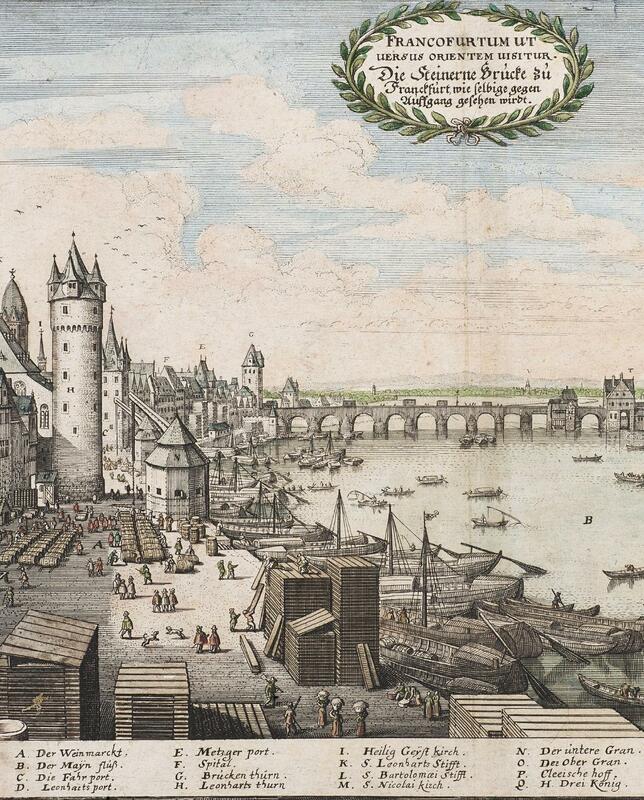 All goods that came to Frankfurt via the river or passed through the city needed to be declared here. Aside from this, indirect taxes and levies collected by the toll office were paid at the city gate (Fahrtor). These charges were mainly for the import and export of commercial goods. 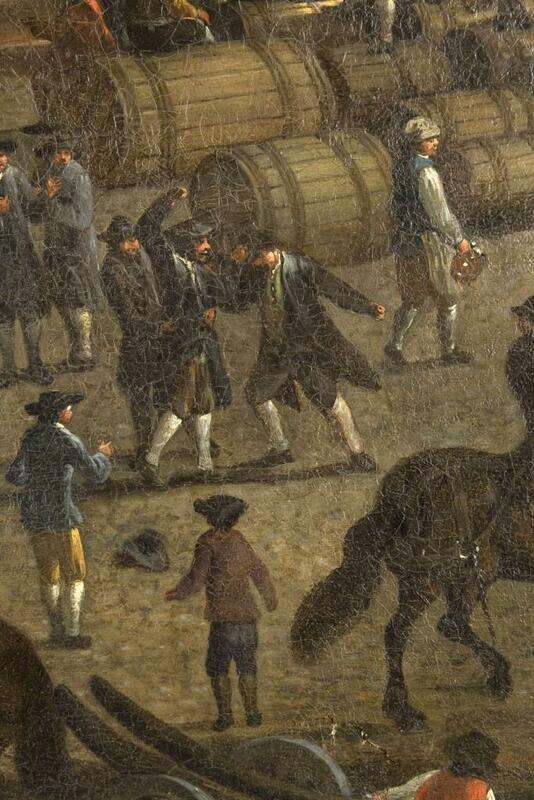 The most important of these was the wine that was delivered in large wooden barrels. 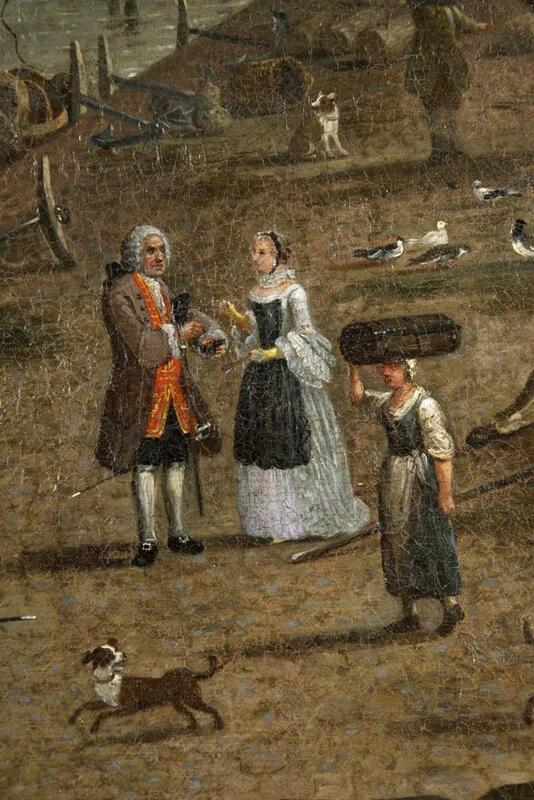 Other goods subject to tax included other drinks, grains, crops and salted, i.e. cured, fish. The takings of the toll office were collected in a large iron-clad chest. This is why the entrusted councillors have been known as the “chest men” since 1383. In 1489, the chest men acquired a room in the Rententurm (Wharfinger’s Tower) in addition to their rooms in the Fahrpforte. The supervision was carried out by the Rechneiamt, as was the entire financial system of the city. Its beginnings date back to the founding of the city’s self-government in the 14th century. The first accounting book was created in 1348. It documented all the city’s revenue and expenses. In 1383, the taxes collected by the “chest men” were recorded in the city’s civil code for the first time. This included the “Ungeld” – a consumption tax on wine, salt and different kinds of foods – that had to be paid by the seller. When wine, beer etc. was imported, the so-called “Niederlage” also needed to be paid; for exports, this was known as “Steinfuhr” – as originally, the carters had to also transport a load of stones for the municipal building authorities for every barrel of wine. In addition to this, there were taxes for using the port crane (“crane money”) and also bridge money at a later date. The exact amount of the taxes was determined in 1727 by imperial commissioners during the Frankfurt constitutional conflict and published in a printed schedule of charges. The taxes were collected in boxes and brought to the audit office once a week. 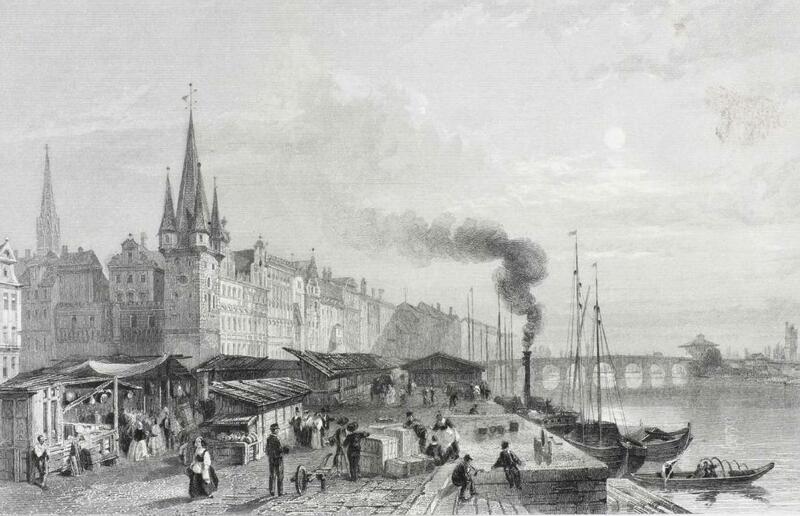 Other customs offices were located at the Alte Brücke (Iron Bridge) and at the Affentor, the Friedberger Tor, the Eschenheimer Tor and the Bockenheimer Tor. 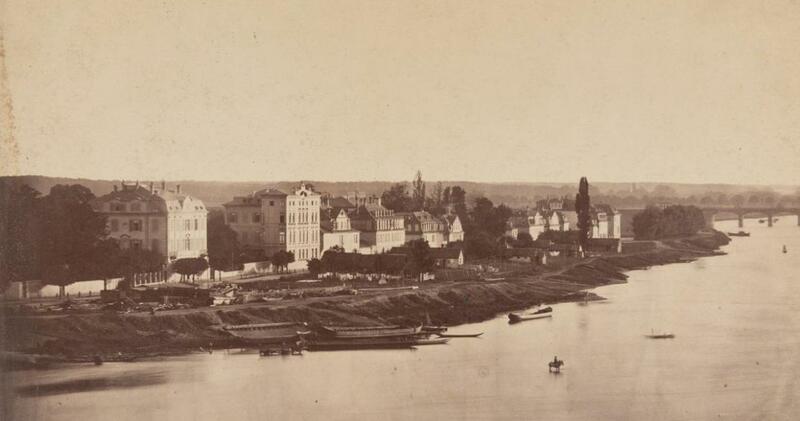 During trade fairs, the Leonhardstor and the Metzgertor at the Main riverbank were also used. The worst flooding in the last millennium was experienced by Frankfurt on the feast day of Mary Magdalene on 22 July 1342. 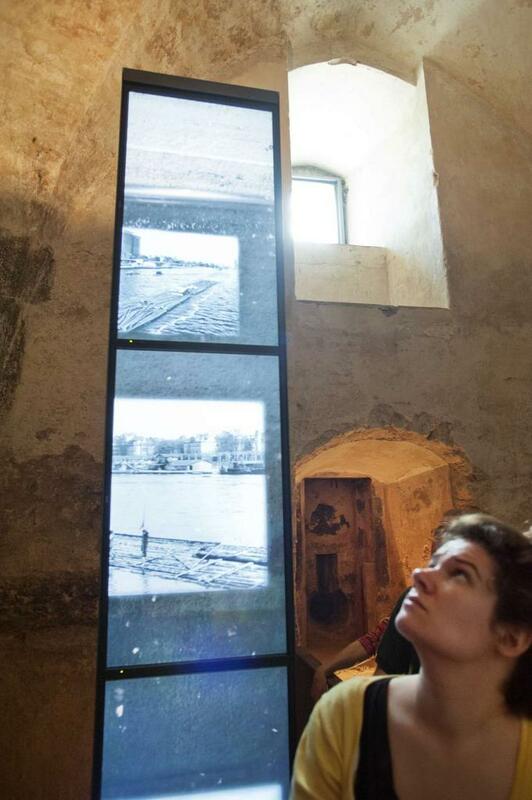 A water level of 25 Rhenish feet was recorded at the city gate (Fahrtor) – the equivalent of 7.85 m today. The city was flooded for miles around. In the Weißfrauenkirche (previous location: Hirschgraben at the corner of Berliner Straße), the water measured around seven feet high, approximately two metres. The high-water mark originates from this church, which is no longer to be seen today. 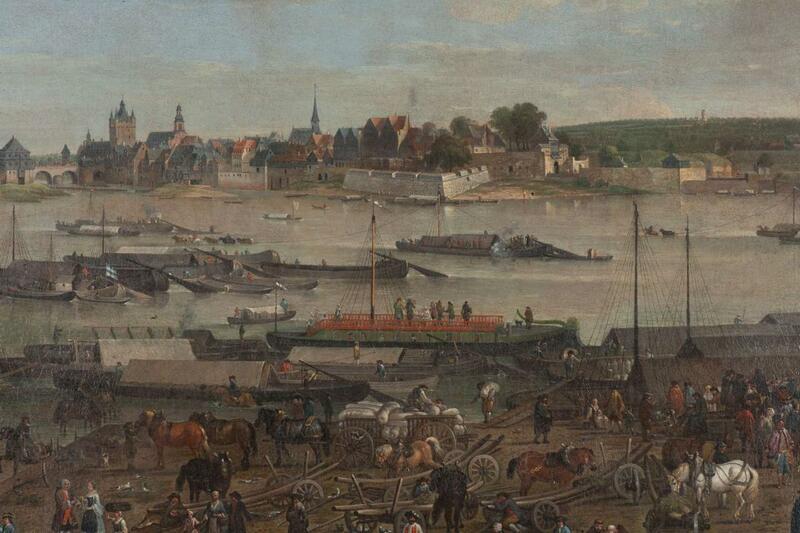 The painting by Friedrich Wilhelm Hirt shows visitors how the Main riverbank could have looked below the windows of the Rententurm around 1700. You will see scenes of hustle and bustle on the widest and most lively spot of the Main riverbank. Ships filled with goods berthed here to load and unload. Wooden barrels, sacks and bales were transported on carts pulled by horses. Sailing ships travelled along the Main; engines were not yet in use. A ferry brings people and goods from one bank to the other. Large ships were also towed by horses on paths at the waterfront. 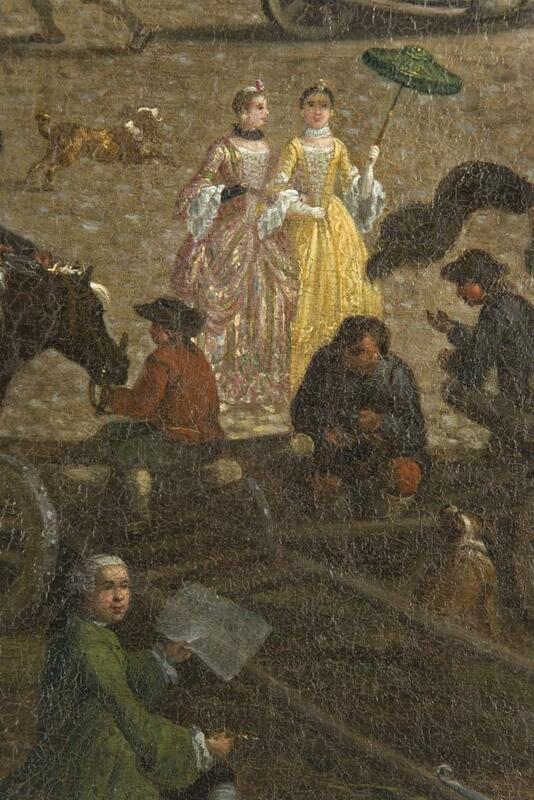 In the painting, the artist brings workers, merchants and high-ranking persons together, which can be seen in their clothes and the activities that they are carrying out. They are quite often shown in discussion: two young women in brightly coloured, floor-length dresses edged with lace are chatting animatedly. A maid with a baby on her arm explains something to a young man in simple clothing. Merchants bargain, workers coordinate their work. They are cheerful little scenes full of life and eloquence. The painter did not want to reproduce reality, but rather created an idealised depiction. 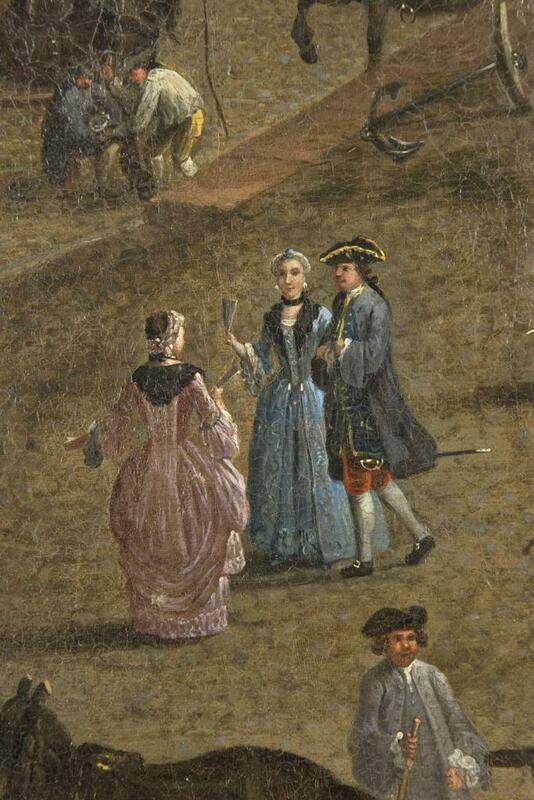 Friedrich Wilhelm Hirt (1721—1772) was famous for his small, elaborate staffage figures. These had already impressed viewers before the picture “Das Mainufer am Fahrtor” (The Main Riverbank at the City Gate) was even commissioned. It was always large-format landscape paintings that he enriched with these. This means that many friendly scenes can be discovered in the Frankfurt panorama as well as in a Wimmelbilderbuch (hidden picture book). Hirt’s painting was commissioned by Duke Anton Ulrich of Sachsen-Coburg-Meiningen. 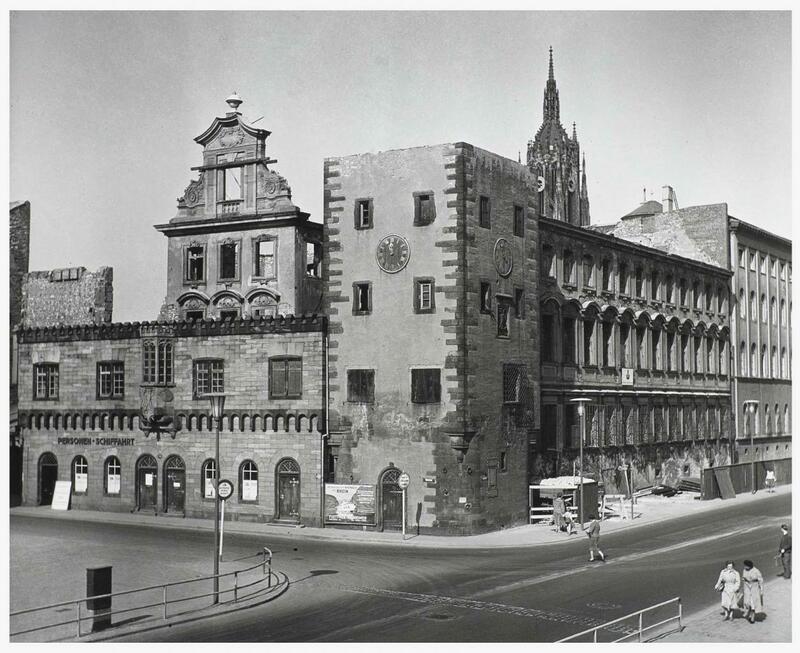 It was supposed to give the latter a view of the colourful Frankfurt life while he was residing in Meiningen. 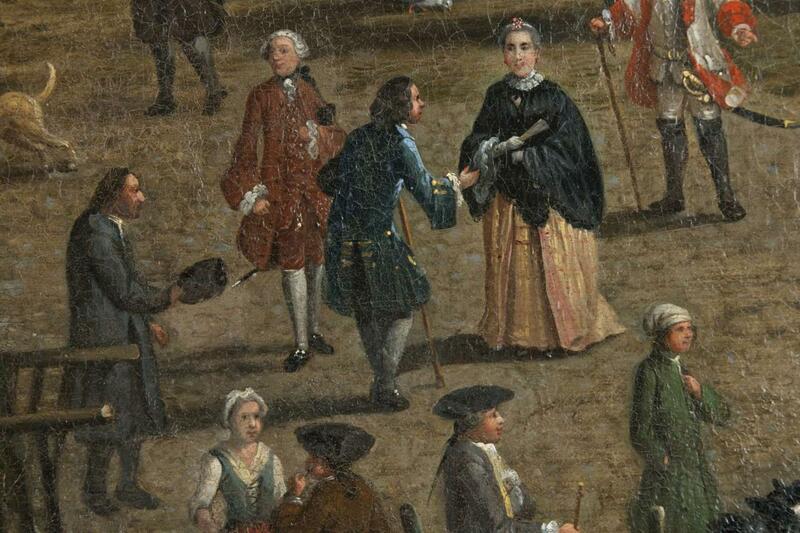 It is possible that he recognised individual people and personalities in the faces and types of Frankfurt society depicted in the painting. 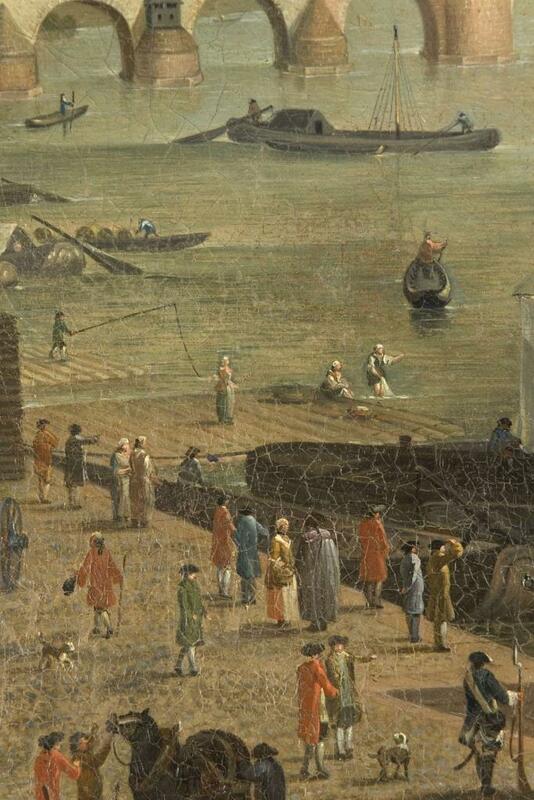 For today’s viewers, the artwork captures life in the city on the River Main in the 18th century. 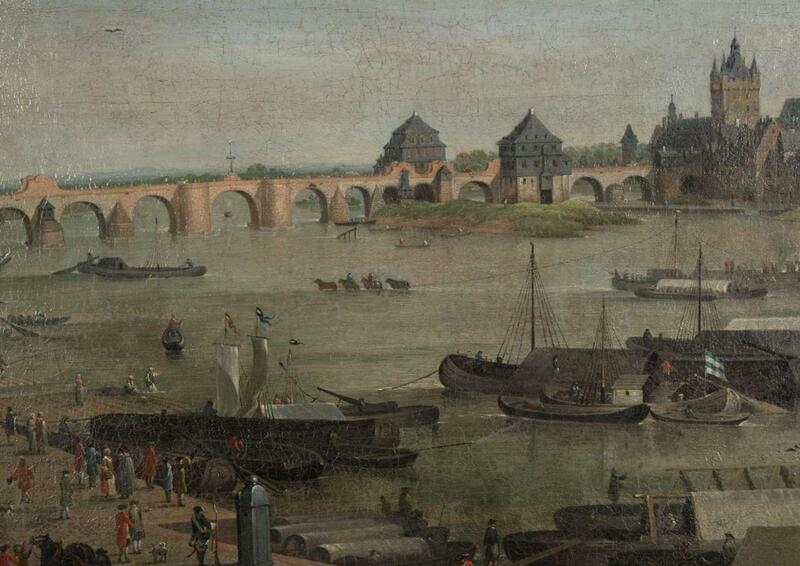 It is fortunate that the Duke commissioned it, as Hirt did not paint him a realistic view of Frankfurt’s Main riverbank, but rather combined the extraordinary and significant in his composition. 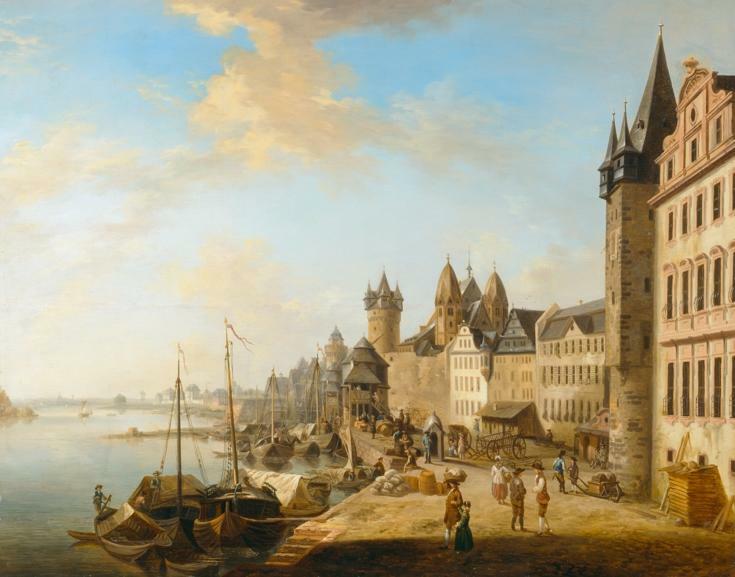 Even its format hints at its importance: it is the largest view of Frankfurt am Main that was painted in the 17th and 18th centuries. In this work, the artist did not use the already characterised view from the west nor the equally refined view from the east. Only the unusual, unique view to the south allowed Hirt to capture the transhipment point at the port whilst doing justice to its significance. He expanded the area at the city gate (Fahrtor) into a stage. 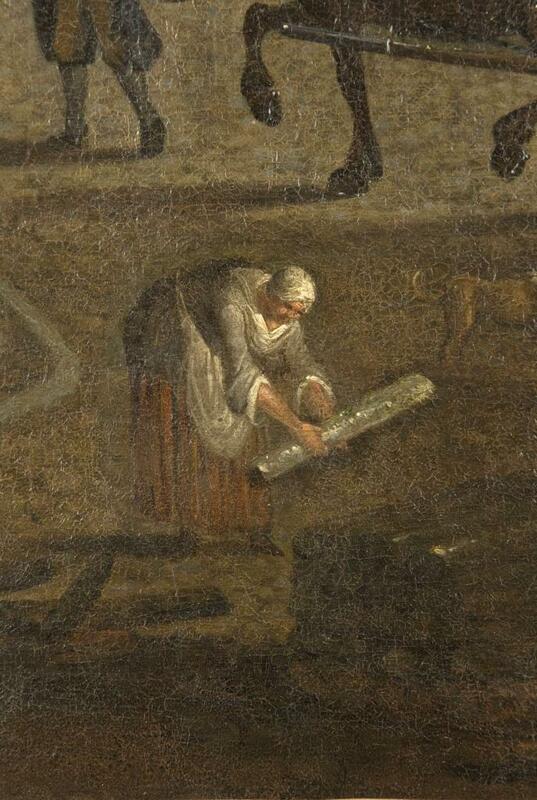 It provides the backdrop for a depiction of the practices of the time. The Rententurm (Toll Tower) is part of museum’s old-build. It forms the Saalhof together with the customs house, and the Bernus, Burnitz and Staufer buildings. Four of the five buildings originate from different centuries.